Why aren't my Payment Express Orders Appearing in Vend Ecommerce – How can we help? Over the last few weeks some retailers have had intermittent issues with orders on Payment Express and Vend Ecommerce whereby the credit card payment is successful, and appears on the Payment Express merchant account, but the corresponding order doesn’t appear in Vend Ecommerce. We have indentified the cause of the issue and have an interim solution for affected customers. 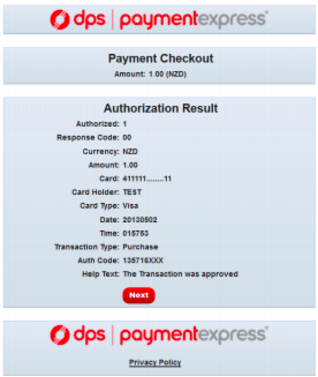 This requires you to turn off the Payment Express 'successful payment' confirmation screen. Turning off the below screen will mean that once the customer has entered their credit card details and the payment is successful, the customer will be redirected to your Vend Ecommerce store “Thank you” page. 1. Login to Payment Manager at the Payment Express link here. Note: If you do not have a Payline account or the 'custom hosted' screen on your Payline portal, please contact sales@paymentexpress.com. 6. To activate the the above changes you will need to contact Payment Express by either emailing support@paymentexpress.com and quoting your PXPay ID in the email or calling the Payment Express support team.